This surname has several unusual features. It is almost certainly of Olde English pre 10th century origins, deriving from the word "haecce" meaning gate, but it is possible that some nameholders may descend from the French "hachette", - a small axe used for fighting. In both cases the name would be occupational either for a maker of gates or axes. The suffix "man(n)" can be used to describe an employee or even a friend or follower, although in this case it probably means "the senior worker" in a small business. The name is unusual in that it has retained its spelling form from Elizabethan times to today, with just the odd recording of "Hutchman" which is clearly wrong, to spoil an unbroken record! In the case of the first recording shown below, the holder is locational, not job descriptive, and somebody who probably lived by a prominent "gate" such as that of the city, but the origin is the same. Other recordings include Thomas Hatchman who married Anne Buche at the church of St Mary Le Bow, London on April 22nd 1582, William Hatchman, who married Mary Donnell at All Hallows Church, London Wall on August 21st. 1705 and Theophelas Hatchman, son of John (!) 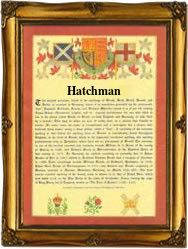 Hatchman, christened at Putney on September 17th 1680. The first recorded spelling of the family name is shown to be that of Richard de la Hacce, which was dated 1273, The Kings Rolls of Wiltshire, during the reign of King Edward 1, known as "The hammer of the Scots", 1272 - 1307. Surnames became necessary when governments introduced personal taxation. In England this was known as Poll Tax. Throughout the centuries, surnames in every country have continued to "develop" often leading to astonishing variants of the original spelling.